A new genetic study of ancient individuals in the Americas and their contemporary descendants finds that two populations that diverged from one another 18,000 to 15,000 years ago remained apart for millennia before mixing again. This historic "re-convergence" occurred before or during their expansion to the southern continent. 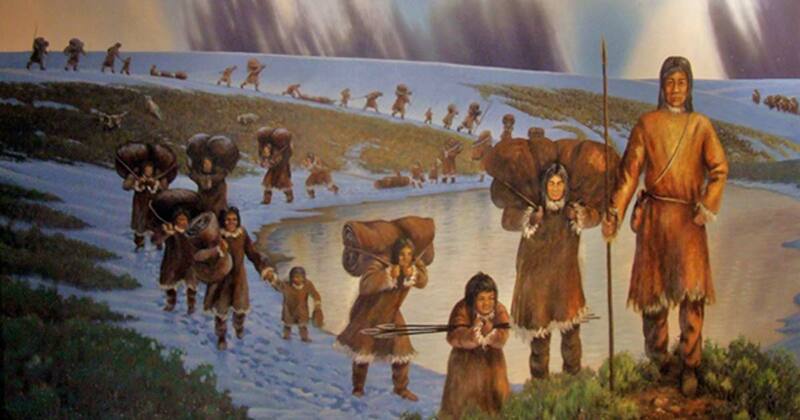 The study shows for the first time that, deep in their genetic history, many Indigenous people in the southern continent retain at least some DNA from the "northerners" who are the direct ancestors of many Native communities living today in the Canadian east. "It was previously thought that Indigenous South Americans, and indeed most Native Americans, derived from one ancestry related to the Clovis people, who lived about 13,000 years ago," said Cambridge University archaeology professor Toomas Kivisild, who co-led the research with University of Illinois anthropology professor Ripan Malhi. "We now find that all Native populations in North, Central and South America also draw genetic ancestry from a northern branch most closely related to Indigenous peoples of eastern Canada," Kivisild said. "This cannot be explained by activity in the last few thousand years. It is something altogether more ancient." "We are starting to see that previous models of ancient populations were unrealistically simple," Malhi said. "The ancient Anzick child from Montana also represents the southern branch and is associated with the Clovis culture, which was once thought to be ancestral to all Native Americans," Malhi said. "The analysis of genomes from ancient peoples from Ontario and California allowed us to identify components of the northern and southern branches in contemporary Central and South American genomes. These components were likely the result of a 'reconvergence' of the two branches deep in time." "The blending of lineages occurred either in North America, prior to the expansion south, or as people migrated deeper into the southern continent, most likely following the western coast," said Christiana Scheib, the first author of the study who conducted the work while at the University of Cambridge. "We don't have ancient DNA to corroborate how early this northern ancestral branch arrived." The article, originally titled ‘ Two ancient populations that diverged later 'reconverged' in the Americas ,’ was originally published on Science Daily. Hmmmmmm, says nothing about Black “NEGROID” native american’s being the first people ha ha ha, well that figures, since articles of this kind are usually racist and have subjective overtones….No mentioning of “LUZIA” of Brazilian area, and “NAIA” skwletal remains found in Mexico, both dating back 15,000 years before the ICE AGE ended, and not possible for travel from the Atlantic because of HUGE Ice Glaziers measuring more than a mile high, as well as “ICE SHEETS”. Yet the Atlantic route leading from African, and with GULF STREAMS pushing directly into Brazil should not be mentioned in such articles. How can people become educated when articles like this one mentions everything except African/South Pacific/Asiatic Negroid people when all evidence points toward them….